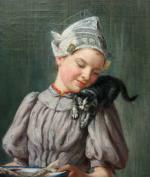 Karl Emil Mücke, also Carl Mücke (1847 - Duesseldorf - 1923) was famous German genre and animale painter of the Duesseldorf school, especially famous for his works with. 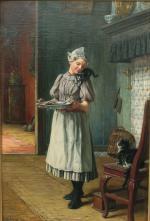 Bildern and domestic animals. Mücke was born in Düsseldorf, the son of the painter Heinrich Mücke. 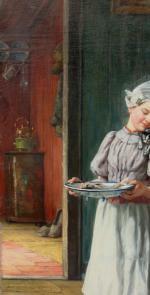 Since 1844, his father was a teacher of anatomy at the Art Academy Düsseldorf, from 1848 professor. At the Academy of the father, where he was still teaching until 1867, Mücke studied from 1863 to 1870. 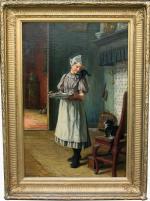 After he was a private student of the genre painter Wilhelm Sohn for a time. His cousin Karl Rudolf Sohn, who was also a private student there, painted 1875 a poftrait of Mücke. 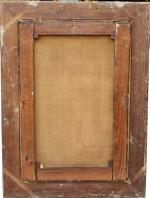 Like the father and almost all other art painters of Düsseldorf, Mücke joined the artist Association Paintbox. 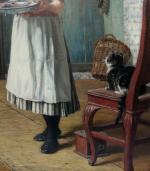 From the 1870s to about 1890, he often stayed in the Netherlands, from 1877 to 1888 in the North Dutch Volendam, where he found the motifs that were characteristic of his painting: genre representations of Dutch in situations of daily family life, Often of women and children in costumes, in company of cats and dogs, in changed interiors or by the sea. Mücke works were also represented at exhibitions in Düsseldorf, Munich and Berlin. 1889 he lived in the Rethelstraße 29 in Düsseldorf-Düsseltal. Literature : Thieme/Becker "Lexicon of artists from antique to contemporary", Leipzig, 1999; on-line wikipedia. Inscription: signed lower left: "Carl Mücke Dsf.(Duesseldorf)". Measurements: unframed w 17 3/4" x h 26 3/4" (45 x 68 cm), framed w 23 7/8" x h 32 7/8" (60,5 x 83,5 cm).